TL;DR - Cadence is the key to effortless, efficient running. Come find your perfect cadence in just 7 runs - it's easier than you think! When you see runners with an elegant, rhythmic flow, it’s easy to think they were born that way. But running is a skill, and what seems hard can be made to look and feel effortless - with enough attention to form and cadence. Cadence is the number of steps you take per minute; for beginners, it’s best to have a cadence higher than 160 steps per minute (SPM), with a goal closer to 180. A higher cadence boosts performance and helps prevent injuries. We all have different body types, so finding your ideal cadence is the key to running that feels more like gliding than grinding. That’s why we’ve set up the #FindYourCSpot Challenge. We’re confident you can optimize your cadence using our music over the course of only 7 runs. Measure your baseline cadence using Weav’s Match My Stride mode. 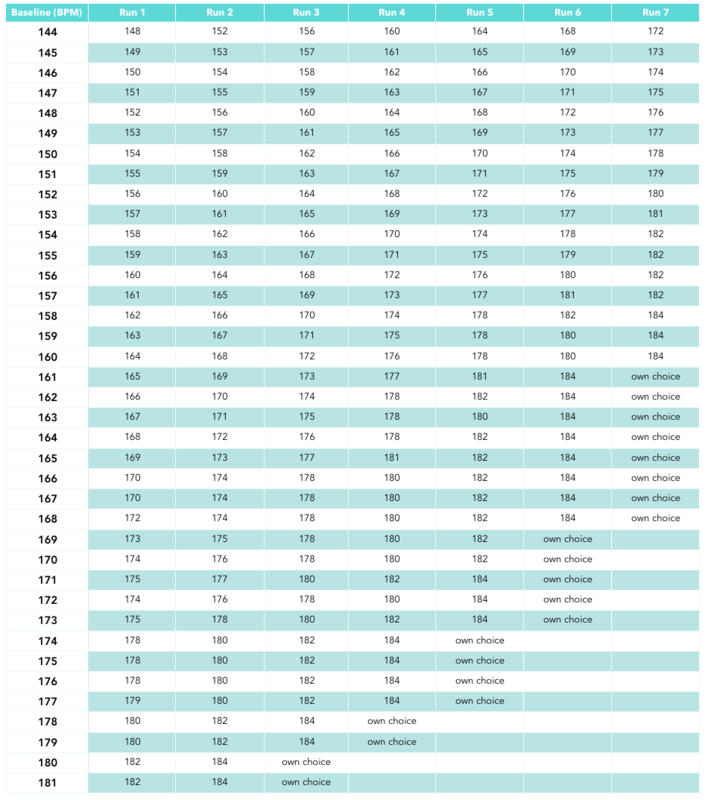 Increase your cadence 1-4 SPM over the course of seven runs using Fixed Tempo mode (see example table below). Easily do this by setting the tempo of the music and upping your steps per minute to match it! Pro tip: try taking smaller steps without increasing your speed. Document each run on social media using #FindYourCSpot, and let us know how each run felt. Email us at cadence@weav.io with screenshots of each post by May 1st to enter a chance at winning one of three Aftershokz wireless running headphones we're giving away!! The time is now… your C-Spot is calling. We’ve run tests with handful of users, and the results are fantastic. “I completed 8 runs and can pretty easily hold a 180 cadence during runs now! Traditionally, runners have used a metronome to measure their cadence (now, more dull than watching paint dry!). Weav automatically detects your cadence for you, so simply go to the "Sessions" tab of the Weav app to see average your cadence. (If you haven't measured your cadence yet, click here to learn how). This number is your baseline cadence. Once you’ve established this, you can begin increasing your cadence over the course of seven runs to a target cadence of around 180 SPM. Check out the handy-dandy chart below to easily plan out your next 7 runs! Your first run - using “Fixed Tempo” mode. Okay, it’s time to do follow through on your run plan! A note before you start: increasing your cadence does NOT mean increasing your running speed. You should actually keep your running pace the same while you focus on simply shortening the length of your strides. Increasing your cadence actually decreases the amount of energy and effort it takes to run, and also becomes much easier when you have the beat at your back. To start, open the app to "Fixed Tempo" mode, and turn the dial to your target steps per minute. Lace up and you're ready to rock! Maintain a steady pace by making sure your feet always land in sync with the beat; don’t worry - the music will do the work for you! Don’t panic if your stride feels unnatural or uncomfortable at first. Keep focusing syncing with the beat of the music, and you’ll be running strong in no time. 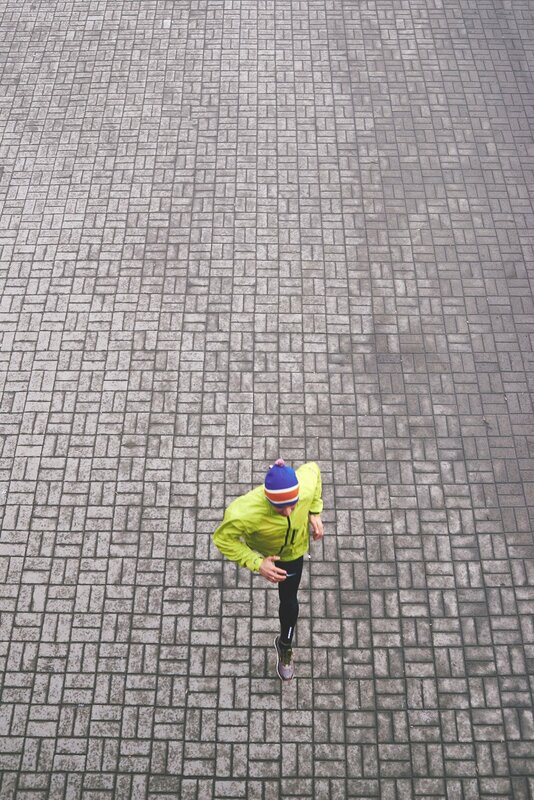 Avoid running with a cadence that’s lower than your baseline. If you need help or advice w your cadence, never hesitate to get in touch with us via direct message on Instagram (@weavrun) or at cadence@weav.io. Document your journey on social media, and tag each post with both #FindYourCSpot and #WeavRun to let us know how every run felt! We'll draw a winner on May 1st to win one of three pairs of Aftershokz headphones ($130 value each) we'll be giving away! Make sure to sign up for the challenge now! So how do I tell which cadence works best for me? While experts recommend around 180 as an ideal cadence, it’s a little different for each person. Why is cadence generally something something that isn’t talked about? While a seemingly simple concept, the benefits of a higher cadence are enormous, and include injury prevention, better performance, and achieving a ‘flow’ state more quickly - running with a higher cadence feels lighter, stronger, and a just easier! But even seasoned runners overlook or knowingly avoid cadence because cadence training can seem like a tedious layer to add to an already difficult process - as if running faster wasn’t hard enough, now you have to count your steps! No wonder no one cares about cadence. But in truth, it only takes around 7 runs to optimize your cadence, and can be fun and easy - so get started today!